This probably only interests me, but I recently saw the folder sizes of my digital pictures and was struck by the growth in the size over time. 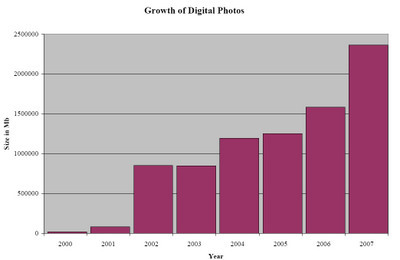 I got my 1st digital camera at the end of 2001 and the number of photos taken each year is growing and growing. I know there are times I snap a picture (or pictures) because I want to have something to add to the blog. I am struck by the fact that 2007 is a little more than 1/2 over and I have 2.3mb in digital pictures already. It must be all the weddings and loon pictures!